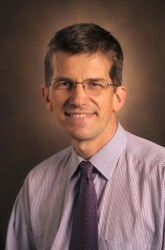 Pierre Massion, M.D., associate professor of Medicine and Cancer Biology, has been named director of the Thoracic Program at Vanderbilt-Ingram Cancer Center. Massion, who joined Vanderbilt in 2001, will lead the wide-ranging program that is designed to perform cutting-edge lung cancer research and provide exceptional services to patients with lung cancer and other diseases of the chest. “I am very honored and excited about the opportunity to enhance our patient care, education and research programs to galvanize the discoveries and foster the academic mission of VICC,” said Massion, an Ingram Associate Professor of Cancer Research. “This is a great opportunity to establish the best clinical and scientific team to fight the leading cancer killer in the nation. This could not be done without the tremendous support from the institution and from our talented faculty and staff. “I want to acknowledge the support from all of the collaborators who have helped me develop and grow into this position, particularly my colleague and predecessor, David Carbone,” said Massion. Massion credits Jennifer Pietenpol, Ph.D., director of VICC, and other VUMC leaders with giving him the opportunity and responsibility to reimagine and expand the program. “Pierre Massion is a dynamic leader whose research accomplishments and commitment to patient care and education make him the perfect choice to lead this effort,” said Pietenpol. Massion and his colleagues plan to enhance the Thoracic Program, which will be segmented into three arms. The first arm features a Thoracic Center led by Joseph B. (Bill) Putnam, M.D., and Otis Rickman, D.O. The Thoracic Center will open a new early detection clinic to screen and distinguish benign lung nodules from early stage lung cancer, when there is the best chance for a cure. Clinicians will use innovative technologies for noninvasive diagnosis as well as minimally invasive thoracic surgeries. They will also expand personalized care for patients who are dealing with more advanced disease, including intensive palliative care for patients. In the Thoracic Center there will be a strong emphasis on the prevention of lung cancer, with an integrated smoking cessation program. The second arm is a Thoracic Educational Program led by Leora Horn, M.D., Eric Grogan, M.D., and Rickman, which is designed to provide academic training for students, fellows and clinicians in preventive, diagnostic and continuing care, with special emphasis on continuing medical education for physicians. “We also want to empower our survivorship group and bring education to the forefront for all of our beneficiaries, particularly patients at risk for lung cancer, as well as patient advocates,” said Massion. The third arm is the Thoracic Research Program, led by William Pao, M.D., Ph.D., and Massion, which will be integrated within the lung cancer center and continue to develop investigator-initiated studies including clinical trials geared toward prevention, early diagnosis, personalized medicine and health services research. “The Thoracic Program will be a collaborative and interdisciplinary team effort to cultivate an outstanding program with the leading-edge lung cancer care and research in the nation,” said Massion.